Small model railways: 38th National Narrow Gauge Convention report. It was difficult to know which blog to put this post under, I have so many of the darned things. In the end, I plumped for this one to give it back some life, and because at least there were some small layouts at the Convention. I've already discussed meeting The Crowsnest tramway and the retirement of Purespring Watercress. So I'll try to keep away from those subjects. Arriving at the convention hotel, it all seemed rather more informal and friendlier than I was expecting. I was quickly directed to Purespring's location in a room full of Canadian and English modellers, (Yes, a layout had come from the UK to attend the convention) and quickly set my layout up. With that onerous task out the way, we went to register. We were given our badges and goody bag and that was it. We didn't even have to prove who were. The quality of layouts in the exhibition halls was amazing, and I felt quite out of place with my scruffy little effort. The convention started in the evening, without any ceremony, and to be honest I was a bit disappointed at that. An official welcome would have been fun. The doors to the exhibition halls were opened and people sparsely drifted in and out. At the same time, in the floor above us, clinics of varying types were going on. Both modelling and prototype related. A few more folks came into the show halls between clinics, but that first day was very quiet. More people dropped in to the morning session on the second day and things got rather busy over at my little layout. I almost talked myself hoarse at times. Afternoons at the convention are taken up with layout visits, and as I was particularly interested in having a garden railway at our new house, I decided to visit those primarily. I saw layouts that ran well, and I saw layouts that didn't. I got warts and all tales about building garden railroads which made me totally reconsider my future plans for the garden. The second evening session was much busier than the first, and I found I talked myself hoarse again. I wanted to attend some of the clinics but found myself too busy talking to even consider going to any, that at least was a very positive sign of interest in the layout. This made the same true of visiting the vendor hall, where I only managed a few short visits. As a person who scratch builds nearly all his work, I was somewhat taken aback by the prices of some of the items for sale. The Friday sessions were very busy with viewers as they worked to fill in their voter slips for the competitions. Many people complimented Purespring, including the staff from the Bachmann Model Railroads display. I was told several times. "I voted for you." The highlight of the evening though was when Bob Brown of Narrow Gauge and Shortline Gazette asked me to write an article for the magazine. Bob was a wonderful, kind gentleman to talk with. 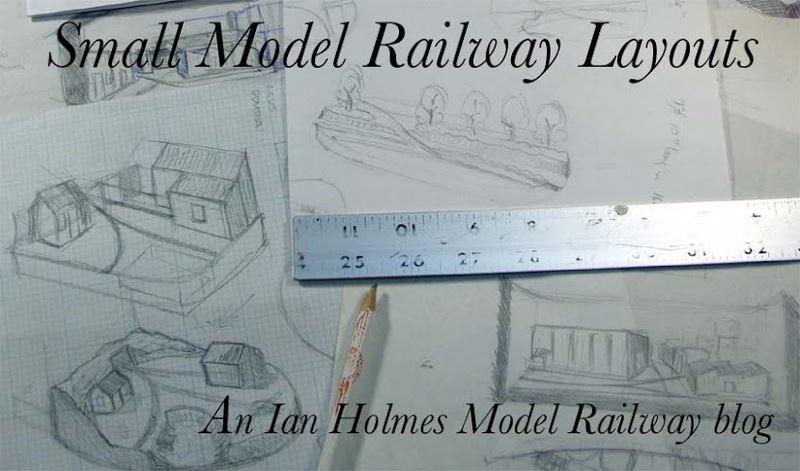 Passionate about the hobby and really wanting to push the idea of small model railroad layouts. Pack up came after the Saturday morning operation session. Things were quiet that morning so I did find time to visit a clinic on Minnesota Logging Railroads that was quite interesting. Living as I do, so close to the venue, I packed Purespring up and took it home, visiting the home layout of Dan Dossa on the way, which I really enjoyed before returning for the closing and competition results. I was quite surprised entering the Hall for the finale, there were a lot more people there than I expected. With people drifting in and out of exhibition halls and clinics for three days you don’t get much of an idea of how many folks are actually there. There wasn’t much of a spread of ages among the modellers though, and the majority were of the older generation. At 55 I felt I was among the youngest. There were prizes to encourage younger modellers but there was only one of them, but he was producing quality work. Many times I've heard people bemoaning the lack of youth in our hobby, but this was really my first experience of it. I didn’t win any trophies, but that didn’t matter I’d introduced many people to Micro Layouts, Watercress farming and cabinet style presentation. After that we ducked out before the charity auction. The days had been long, longer than an eight hour work day, and my wife and I were exhausted. Seeing all these excellent layouts close up did have an effect on me. It may have taken me many many years to reach this conclusion, but I need to concentrate my modelling on the things that I know about. I really enjoyed informing people about Watercress Farming and the Vitacress Farm Railway. I have no need to try and model in US HO scale or even On30. There are many great American modellers producing far better models than I ever could. My knowledge and interests lie with Minimum gauge railways (the Watercress Farm and the works of Sir Arthur Heywood etc;) and Lincolnshire Potato Farm Railways. Before the results announcement I was asked by Art Vandewater, who co-ordinated the showing of all the excellent layouts on view, if I'd ever consider attending another convention. On balance, I think I would. There was a lot that I didn't see. There were several clinics I would have like to have attended, and I would have liked to have seen more home layouts as well. I don't think I'd travel all the way to Sacramento next year but St. Louis in 2020? That's a possibility. Some views of the Many Garden Railways I saw. Now, some scenes from the layouts in the exhibition halls that caught my eye. The other side of The Island Railway. In closing, I'd just like to register my thanks to everyone who helped make the convention the success it was. From the organising committee and people who opened their houses to visitors to watch trains, to all the volunteers who helped in whatever shape or form. Well done everyone! Purespring Watercress. The end of an era.